I don’t know about you, but after I come back from a place in which I’ve eaten really well, I’m often still craving the foods from that city or country for the following few weeks (if not longer). It doesn’t matter that I most likely overindulged (and that’s putting it mildly) while travelling. I just want to keep enjoying all the yummy local, seasonal dishes from those great places for as long as I can. I know, on the flipside, some travellers experience food fatigue when overseas for too long. I remember, as a child, being dragged into Chinese restaurants in Europe by my own mother. “Enough!” She’d exclaim after going without Asian flavours for too long. A proper meal, in her mind, meant a meal centered around steamed white rice and a variety of savoury dishes. Cream sauces and big plates of one kind of meat just didn’t make sense to her. My darling wife S and I, however, have the opposite problem. Inevitably, whenever we come back from a trip to Japan, we’ll spend the next 2-3 weeks recreating dishes and flavours, using both ingredients we’ve carted back as well as sourcing stuff locally. Similarly, since coming home from our pre-Christmas trip to Venice, we’ve been dipping into our various regional Italian cookbooks and been whipping up an endless parade of Venetian dishes, for ourselves and for friends. 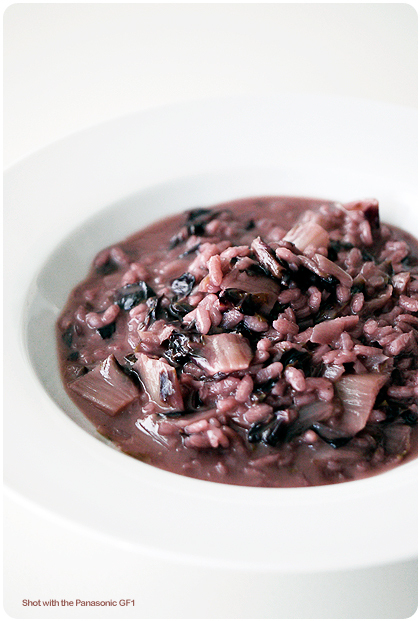 One of the dishes we’ve really been enjoying is a simple risotto made with Treviso radicchio. We ate quite a a bit of this lovely bitter vegetable during our stay in Venezia and I was thrilled to discover it is readily available at Huber’s Butchery here in Singapore. Treviso radicchio, from the region of Veneto, is prized as the best and most flavourful kind of radicchio. While a highly seasonal vegetable — in Italy, it starts to appear in markets in late November and is available through the winter — because of cultivation in different hemispheres, the folks at Huber’s tell me, they can now get good quality Treviso radicchio throughout the year. Treviso radicchio is a pretty versatile veggie. You can grill it, eat it raw, braise it, or use it in stuffings (for say ravioli or lasagna). It works well contrasted with rich or acidic flavours. One of the most popular ways to prepare it, which I particularly enjoy, is in a risotto. I like how the bitterness of the radicchio is softened and tempered by the long cooking process and complimented by the cheese and butter in the dish. For our risotto, we also specifically used some beautiful vialone nano rice from artisanal producer DeTacchi. Vialone nano is grown in the Veneto region. When used for risottos, it releases less starch (than carnaroli or arborio) but is able to absorb a good amount of the cooking liquids. The result is a risotto that is slightly soupy, but with rice grains cooked at a lovely al dente texture and that are bursting with flavour. This is a great dish to kick off a hearty Italian meal or to eat at home on a cold, wet day. Or if, like us, you want to bring a little bit of Venice into your home, even for just a few hours. Cut away the bottom ends of the radicchio. Discard them. 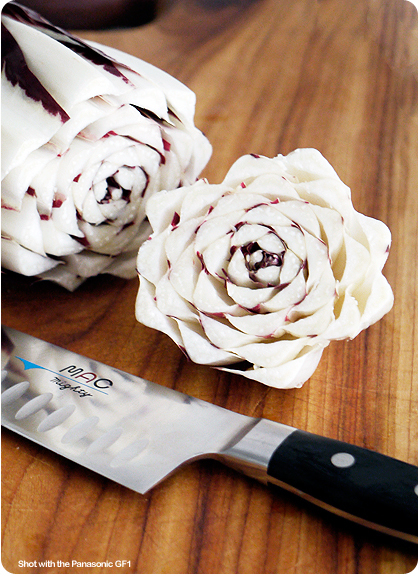 Wash the radicchio and drain well. Cut lengthwise into quarters and then chop up into small pieces. Put the stock into a pot or saucepan and keep warm. In another saucepan or pot–essentially your favourite thing for cooking risotto–heat up the olive oil over medium-high heat. Saute the onions, stirring them frequently. When golden, toss in the radicchio. Lower the heat a touch. Add a pinch of salt and cook, stirring every so often, for 10 minutes or until the radicchio has all gone soft. Add the red wine and let this cook for a minute. You want all the alchohol fumes to subside. Then add the rice. Let this bubble and cook for 2-3 minutes, stirring. 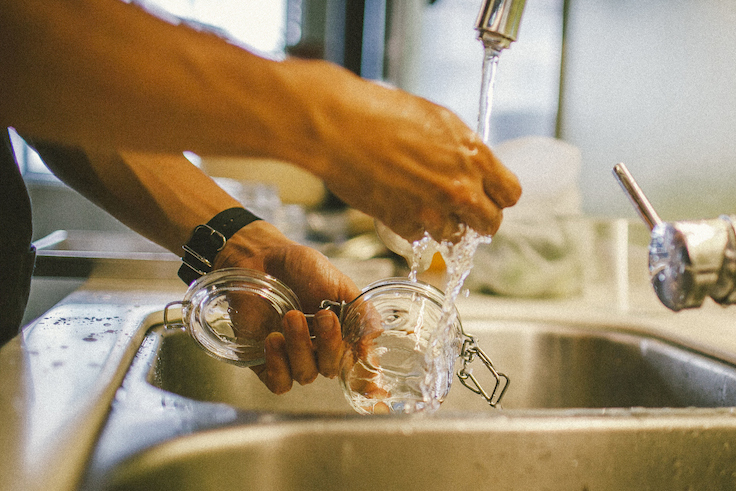 You want to liquid to reduce a little. Add 2 ladles of the stock into the rice. Lower the heat to medium-low. Stir and cook until the liquid has been mostly absorbed by the rice. Then add another 2 ladles. Keep repeating this process until almost all the liquid has been used up. When you have just a few ladles left, you should taste the rice. The perfect consistency is a little firm on the surface but creamy inside. If it is already close to this, then you know you can add less stock. If too hard, you will need to add more. You can also then add a bit more salt to taste. But not too much because you’ll be adding cheese at the end. When you feel the rice is the right texture and you have just a bit of liquid in the pot, turn off the heat, stir in the butter and the parmesan. Taste again and add salt and pepper to taste. Serve. Cool, didn’t know red wine could be use for risottos as well. Always see vermouth or white wines being used instead. Thanks for introducing the Radicchio, prior to this have never heard nor seen it before. Am now wondering how it tastes like. It looks alot like a purple chinese cabbage. Not related to risotto or radicchio but I just wanted to say: your blog is the greatest. Thanks! And…¡Viva Singapura! Thanks for this A – first learned this dish at the house of Prof EG in London – a scholar of Islamic art who lived many years in Venice. 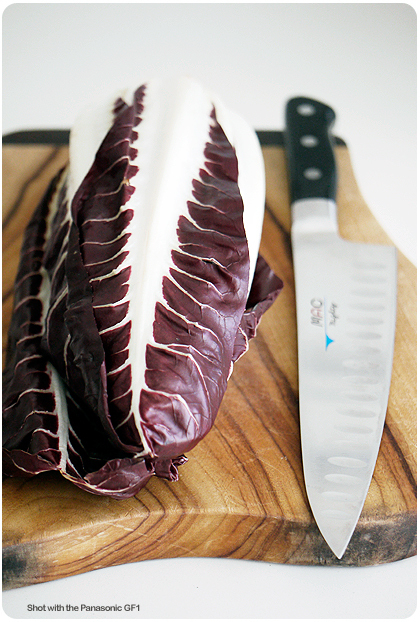 Had no idea you could get nice radicchio in Singers…also lovely grilled. Thanks for the recipe. My university canteen (I know! That’s food appreciation in Italy :D) serves this regularly and I’ve been wanting to replicate this at home. Hey been reading your blog for a long time and always loved your recipes! finally theres one on risotto and thats something i tried once and had to replicate it. will try out this recipe real soon ThankS! You’re right – it’s amazingly versatile. I stayed with friends near Treviso and spent a week eating the ‘tardivo’ – late radicchio. So I can testify that the risotto is delicious, the lasagne sublime and, served with roast polenta, the dish truly comes into its own. Sorry for my terrible english, I come here for the first time today and I would like to congrat for the the nice blog. As italian I can’t resist by make a clarification: the one you used is not the real Treviso Radicchio! The real one has different leafs, ‘fatter’ and ‘flashy’. His flavor is incomparable! If you have the chance try it. It’s something melt in your mouth and so delicate. And it’s expensive too (but you’ll enjoy!). Nontheless your risotto looks great! Thank you! As a chef and restaurant owner(just retired) I want to let you know how much I enjoy your work. I’m coming to Singapore this month. Can you recommend a good shop for Asian ingredients to bring back with me? In return, It would be my pleasure to bring anything you want from Italia. Look forward to hearing from you. Great recipe and a new variation for me who is into different food cooking and preparations. Thanks for sharing.